COMMENTARY ON "AN INHERITANCE INCORRUPTIBLE"
This week’s lesson draws from 1 Peter 1. 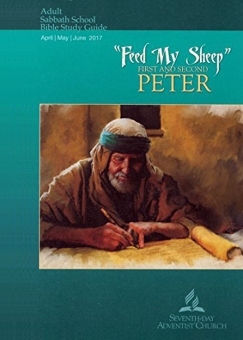 The point of the week’s studies is actually a bit unclear, but it appears that the author is attempting to explain the rich passages of Peter’s explanation of the fact of a believer’s new birth which is founded in the resurrection of Jesus, kept by the Father, and produces a life of godliness as the believer trusts the living word of God. Adventism, however, cannot teach the finished work of Christ that does not depend upon our good works to ultimately prove we are safe to save. Because of the deep skew of Adventism’s understanding of what it means to be saved, we will address this week’s lessons by examining the discussion questions and the teacher’s comments as well as paying attention to some of the statements made throughout the week’s studies. Because the words of the studies are often benign on their own, the underlying assumptions are more clear when we examine the questions and underlying teachers’ goals. The lesson extends several options for understanding who the “aliens scattered throughout Pontus, Galatia, Cappadocia, Asia, and Bithynia” actually are. In fact, Peter is writing to believers who live in gentile territories, and the recipients are probably both Jewish and gentile Christians. Significantly, Acts 2 records that many of the Jews who heard Peter preach on the Day of Pentecost in Jerusalem were Jews who had come to the city for the feasts of Passover and Pentecost. The 3,000 converts who were baptized on that day included many people from the very places Peter addresses in verse 1 of this epistle. The bottom line is this: Peter is addressing Christians who have been born again, converted from unbelief from both Jewish and gentile backgrounds. Both the Jews and the gentiles come from dead traditions; the Jews’ dead traditions involve the observance Judaism without acknowledging the fulfillment of the law in Christ. The gentiles’ dead traditions involve the paganism out of which God had called them. “No one can come to Me unless the Father who sent Me draws him; and I will raise him up on the last day” (Jn. 6:44). “This is the will of Him who sent Me, that of all that He has given Me I lose nothing, but raise it up on the last day” (Jn. 6:39). “This is the work of God, that you believe in Him whom He has sent” (Jn. 6:29). “For it is for this we labor and strive, because we have fixed our hope on the living God, who is the Savior of all me, especially of believers” (1 Timothy 4:10). How do we reconcile these apparent contradictions? If God is utterly sovereign and foreknows (not merely an intellectual knowing but ann intimate knowing) those who are elect, and if not all people are elected, how can we have freedom to believe? The answer is we cannot reconciled these apparently contradicting facts. We are commanded to believe that both things are true, that from God’s perspective they do not contradict. We are to act on what Scripture says without attempting to resolve the apparent contradictions. If God is not utterly sovereign, He is not God. If He makes sense from a human perspective, we, then, are on an equal footing with Him. God is God; we are to believe He has foreknowledge of all whom He elects. Concurrently, we are commanded to believe. When we hear the gospel, our appropriate response is to humble ourselves in repentance and to believe in the finished work of the Lord Jesus. First, Peter is addressing believers, not people who have not been born again through the living word of God. Adventists cannot be assumed to be born again; they believe an unbiblical gospel, and they are not generally aware of the reality of Jesus completely finished work that renders the law fulfilled and obsolete. Blessed be the God and Father of our Lord Jesus Christ! hAccording to his great mercy, ihe has caused us to be born again to a living hope jthrough the resurrection of Jesus Christ from the dead, 4 to kan inheritance that is imperishable, undefiled, and lunfading, mkept in heaven for you, 5 who by God's power are being guarded nthrough faith for a salvation oready to be revealed in the last time. 6 In this you rejoice, though now for a little while, if necessary, you have been grieved by pvarious trials, 7 so that qthe tested genuineness of your faith—more precious than gold that perishes rthough it is tested by sfire—may be found to result in tpraise and glory and honor at the revelation of Jesus Christ. 8 uThough you have not seen him, you love him. vThough you do not now see him, you believe in him and rejoice with joy that is inexpressible and filled with glory, 9 obtaining wthe outcome of your faith, the salvation of your souls. In context, the inheritance being kept for believers is not merely a “place”. It is much more, and it involves being joint heirs with Christ, as Paul explains in Romans 8:16-17. The subtlety of the twist above depends upon understanding that to an Adventist, the “living hope” they have is the “hope” of the second coming. to a Christian, however, “living hope” is the reality of being born again to eternal life the actual moment one believes. As John 5:24 says, he who believes passes from death to life and does not come into judgment. The lesson says that the “living hope” DERIVES from the resurrection and is GROUNDED in an inheritance reserved in heaven. These two statements are in direct conflict. Peter says our living hope come through the resurrection. It is not a derivation of the resurrection; rather, Jesus’ resurrection, His complete conquering of sin and His breaking the power of death, has made it possible for us to receive new hearts and new spirits NOW. We have a living hope NOW because of what He accomplished through His resurrection. This new life which is true for our spirits the moment we believe means we have a guaranteed inheritance. The lesson says our living hope is grounded, or founded and planted in the promise of an inheritance. This is completely opposed to the Bible’s teaching. Our living hope—which is NOT the “second coming” in this context—is our new birth that is ours through believing in Jesus. Our new birth is not grounded in a promised heavenly inheritance. Rather, our heavenly inheritance is a GUARANTEE to all who have been born again. The quarterly explains this exactly backwards because Adventism cannot admit that people are literally made eternally alive in their spirits the moment they believe. They cannot admit that those who are truly born again are kept by God through all of life’s trials, and they are kept FOR an inheritance (not just a place) that is theirs eternally in the presence of the Lord. In reality, one is not “motivated to a Christian” in the way one might be motivated to become a Buddhist or to become a doctor. One becomes a Christian when one is confronted with the truth of what Jesus has done and is convicted of one’s sin. One becomes a Christian when he sees his sin and recognizes that He needs a Savior—and that Jesus has done the work of saving him. Being a Christian is not an intellectual decision that points one in a direction defined by lifestyles and doctrines. Yet this idea is what the question implies. Because Adventism cannot acknowledge the biblical fact that we are born spiritually dead in sin and are by nature objects of wrath (Eph. 2:1-3), it has no capacity for understanding what it means to live as a saved person. We are made alive by God’s Spirit when we trust the finished work of Jesus. We live as saved people by trusting the Spirit who indwells us and who replaces the law as our rule of faith and practice, as described in 2 Corinthians 3. We are Christians, if we are, because we have admitted our intractable sin and have trusted the finished work of Jesus as payment for our sin and as the Source of our spiritual life. “For whoever does the will of my Father in heaven is my brother and sister and mother” (Mt. 12:50). When we are born again, we are literally born of God (John 1:12). We move from being in Adam to being in Christ (1 Cor. 15:22). We become the brothers of the Lord Jesus (Heb. 2:11). We are not merely trying to get along with others who share a purpose and dream and goal; we are literally adopted by the Father and are the legal and true born again sons of God (Rom. 8:14-17). Love for our true family who share the Spirit of God is still hard, because we still possess sinful flesh. Peter’s admonitions to “love one another from the heart, for you have been born again not of see which is perishable but imperishable, that is through the living and enduring word of God” (1 Pet. 1:22-23) is not a command to figure out how to treat one another more lovingly. Rather, it is a reminder that they are already God’s sons and daughters, literally born again through the living word of God which brought them the gospel. They are being called to remember that they are eternal beings, already ushered into eternal life, and they do not have to be crippled by the fleshly reactions of selfishness and lust and resentment because they HAVE the living word of God and the Spirit of God in them. Peter is not calling his readers to strategize ways to be more loving. Instead, He is calling them to remember who they already are and to submit themselves to the living word of God which will give them direction as they interact with one another, eternally alive brothers and sisters who share the resurrection life of the Lord Jesus. Their sinful flesh is now subject to their trust in God; they are not limited by their own good ideas. Only a born-again person can actually love another person as God would love. Today’s discussion questions again reveal the earthly perspective of the Adventist worldview. We cannot intellectually figure out what is significant about the Resurrection. It is pointless to discuss what an “inheritance incorruptible” means and what it is. We can’t figure out how to make choices so we can learn better from our trials. Instead, when we are truly born again, these biblical realities are revealed to us by the Holy Spirit. He is the One who makes the Bible come alive and reveals the eternal significance of all of these realities. Those who are not born again but who try to live according to biblical principles will simply be frustrated. Their idea of Christianity will be similar to their ideas of other religions, such as Buddhism or Islam or atheism. They will intellectually evaluate its tenets and decide how they think they should implement them. Christianity, however, is not a philosophy or a man-centered religion. It depends upon trust in God the Son and His finished work of atonement and His resurrection. When one trusts what Jesus has done and who He is, that person is transferred from the domain of darkness to the kingdom of the Beloved Son. No one who has not trusted in Jesus Alone Plus Nothing will not be transferred out of death into life. Once transferred, however, these biblical principles become reality. They are not strategies, but they are understandable ways of life as one submits to the word of God. Copyright 2017 BibleStudiesForAdventists.com. All rights reserved. Revised March 29, 2017. This website is published by Life Assurance Ministries, Camp Verde, Arizona, USA, the publisher of Proclamation! Magazine. Contact email: BibleStudiesForAdventists@gmail.com.